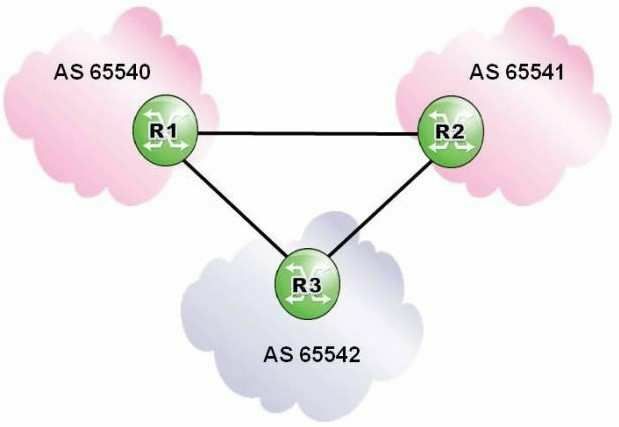 BGP sessions to routers R1 and R2, which of the following is TRUE? Both neighbors R1and R2 should be part of AS 65540. Both neighbors R1and R2 should be part of AS 65560. Neighbor R1should be part of AS 65550, while neighbor R2 should be part of AS 65540. 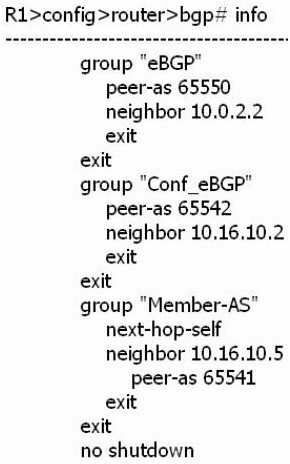 Neighbor R1should be part of AS 65550, while neighbor R2 should be part of AS 65560.
into BGP. 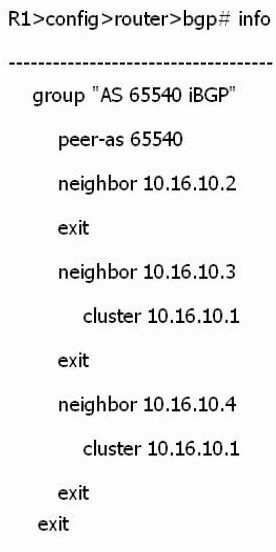 Which of the following databases contains the routes for these networks? The routes are in the RIB-In. The routes are not in any of the BGP databases. The routes are in the Loc-RIB. The routes are in the RIB-Out. 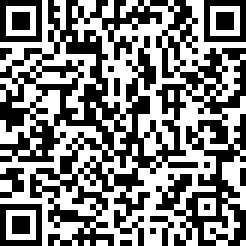 expression ".+ 65540". Which of the following regarding updates originating in AS 65540 is TRUE? Router R3 rejects all updates originating in AS 65540. Router R3 accepts updates from both routers R1 and R2. Router R3 accepts updates received from router R1 and rejects updates transited throughrouter R2. Router R3 accepts updates transited through router R2 and rejects updates received fromrouter R1. Which of the following prefix lists include prefixes 192.168.128.0/17 and 192.168.64.0/18? Prefix list 192.168.0.0/16 through 18. Prefix list 192.168.0.0/17 through 18. Router R2 is advertising prefix 192.168.1.0/27 with community "no-advertise" towards AS 65002. Which routers receive an update for that prefix? Router R2 does not advertise an update for the prefix. Routers R3 and R4 only. Routers R3, R4 and R5 only. Routers R1 and R2 are redundant route reflectors with clients R3 and R4. Router R1 is a route reflector with clients R3 and R4. Routers R3 and R4 are route reflectors with clients R1 and R2. Router R1 is a route reflector with clients R2, R3 and R4. 192.168.1.0/27 contain when viewed on router R8? 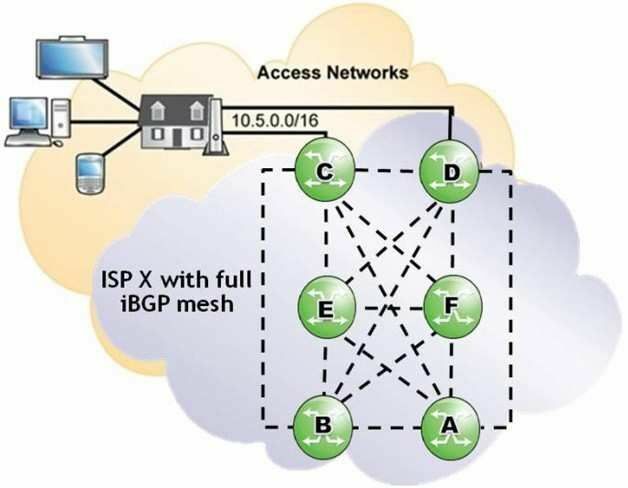 iBGP, what is the required number of BGP sessions within the confederation? Which of the following statements regarding BGP Fast Reroute is FALSE? 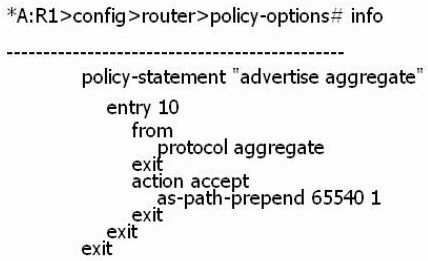 BGP Fast Reroute is triggered by IGP events. 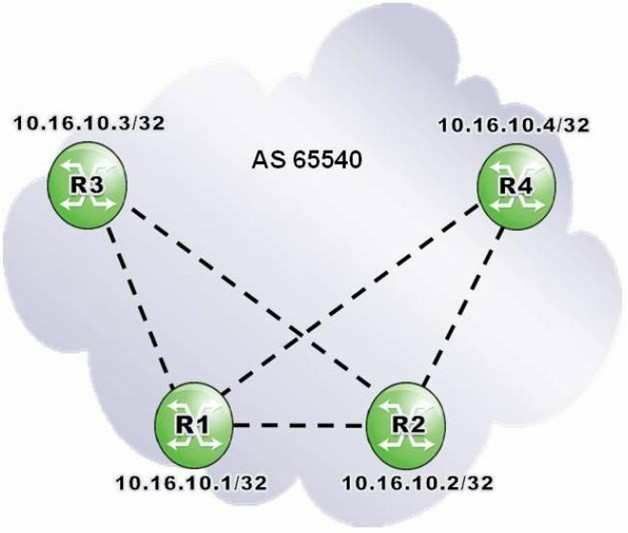 BGP Fast Reroute uses the optimal path to the destination. The backup path is pre-computed and installed in the FIB. BGP Fast Reroute is independent of number of affected prefixes. 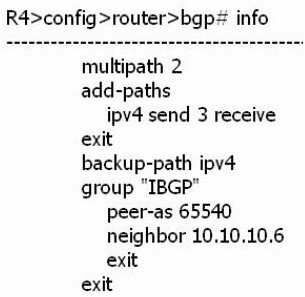 and backup paths will be present in router R4's BGP routing table? One primary path and one backup path. Two primary paths and one backup path. One primary path and two backup paths. What will happen if an update is received with an unrecognized optional non-transitive attribute? The router will accept the update and send a notification. The router will accept the update and propagate the attribute. The router will not accept the update and send a notification. The router will accept the update and ignore the attribute. which of the following best describes the route advertisement within ISP X? Router C sends the update to routers E and F only. Router C sends the update to routers A, B, D, E and F.
Router C sends the update to routers D, E and F.
Router C sends the update to routers A, B, E and F.
most likely relationship between ISP 1 and the other ISPs? ISP 1 has a peering relationship with ISP 2 and ISP 4. 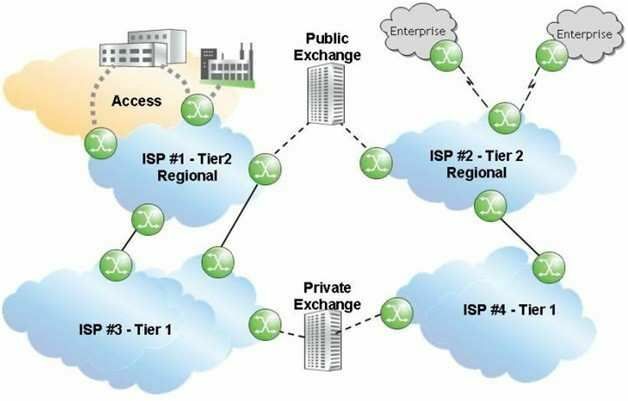 ISP 1 has a transit relationship with ISP 2 and a peering relationship with ISP 3. ISP 1 has a transit relationship with ISP 2 and ISP 4. ISP 1 has a peering relationship with ISP 2 and a transit relationship with ISP 3. ISP 1 has a peering relationship with ISP 2 and ISP 3. It is impossible to determine without the value of the origin code for both routes. What is the purpose of configuring a triggered-policy on an Alcatel-Lucent 7750 SR? Policy changes are delayed until the peer router with the affected routes reboots. Policy changes are delayed until the router reboots. Policy changes are delayed until route updates for affected BGP routes are received frompeers. Policy changes are delayed until BGP sessions are cleared or BGP is reset. "client2" routes will be tagged with communities "West" and "North". "client2" routes will be tagged with community "South". "client2" routes will be tagged with communities "West", "North" and "South". "client2" routes will be tagged with community "West". router R2 in 65550. 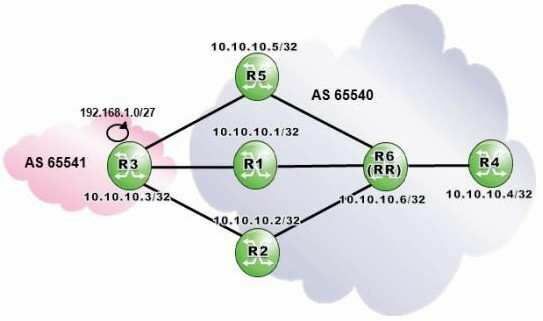 What is the AS Path of the aggregate route received by router R2? What class of attribute is Originator_ID?